An aspect of Roma culture which has often intrigued many is their practice of divination, or fortune telling. 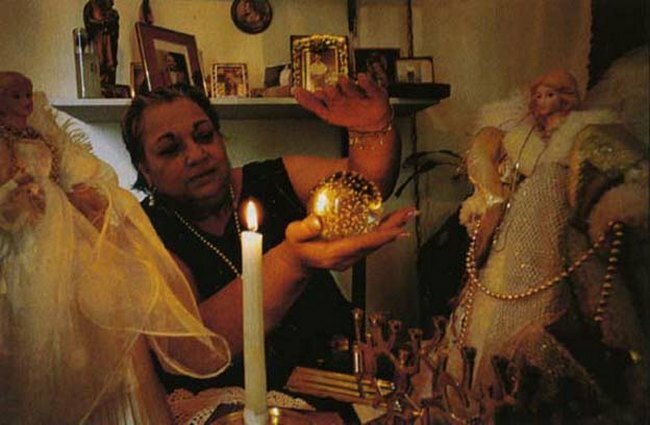 Fortune telling is commonly associated with the Romani people, and for good reason as divination forms an integral aspect of Romani culture, dating back hundreds of years. 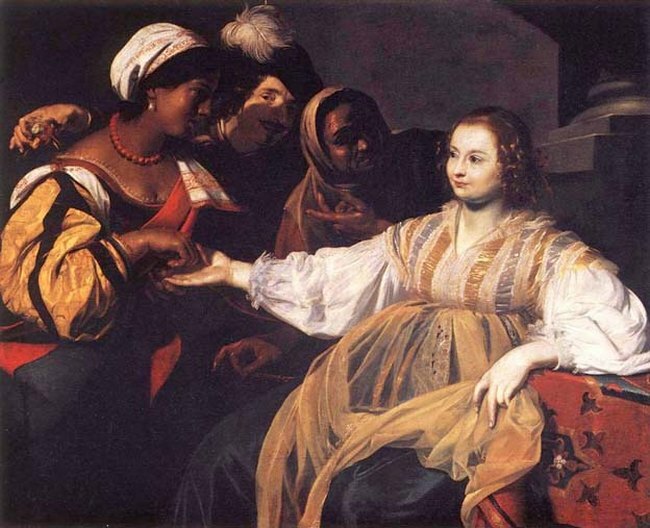 As with Romani tradition, Roma fortune tellers are always female, the fortune tellers in question known as drabardi. Fortune telling acts a livelihood to some, but one must bear in mind that the Romani only practiced divination as a source of income with non-Romani people, that is, the Gadje; they never did so amongst their own people. In ancient times, almost all Roma were fortune tellers. Roma divination highly valued, as their truthfulness legendary. Especially revered skilled fortuneteller who can accurately tell you about all the events of the past and the future. There is a hypothesis that clairvoyance nomadic people skills learned in Byzantium. And soon, thanks to the constant relocation famous Roma fortune telling quickly spread around the world. 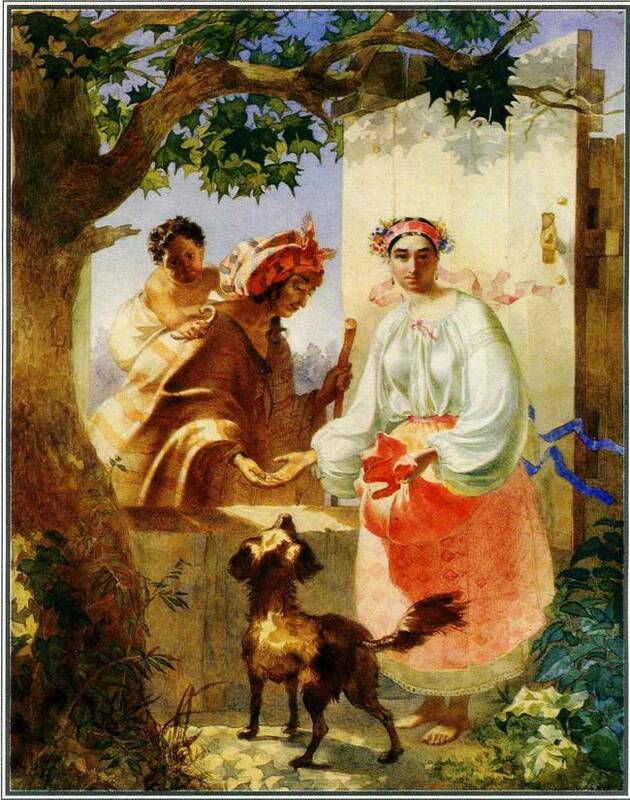 The famous Pushkin tale about some Roma who reminded the poet (while Pushkin in Chisinau) death of the “white man.” Researcher’s work of Pushkin’s life noted that the poet, reacted to the predictions very seriously. Many of Pushkin’s biographers believe that the image of the “white man” Roma predicted the death of the poet from the bullet of blond Dantes. And, here’s another real case of clairvoyance. It is described in the diary of Maria Alexandrovna Ulyanova, Lenin’s mother. Lenin’s mother, after the arrest of the elder son Alexander was very afraid that the younger, Vladimir, would follow in his footsteps, and ended his life on the scaffold. And then she turned to Roma woman “Grandma Rose”, known in Simbirsk as fortuneteller and clairvoyant, asking for help at the time. Roma said the eldest son already cannot help, but she will save the young one and promising that whatever he was doing, all will end well, even if he will commit crimes, it will still be interpreted in his favor. And although he will die very hard, but as a great man, which will ruler of Russia. She also said that after his death, people will remain at the mercy of his ideas. The reality surpassed the prediction. After all, to this day for many people, her son Volodya and now still “very much alive”. 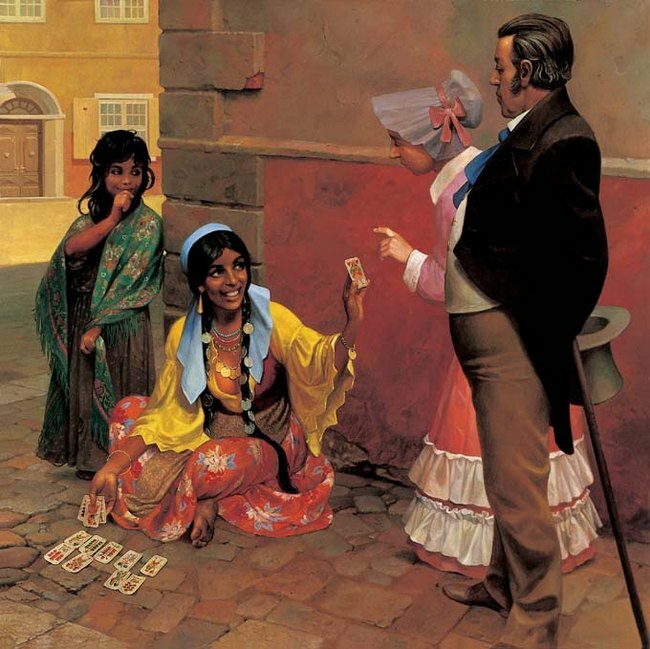 Traditionally, throughout history the Roma people have been associated with fortune telling, common methods of fortune telling included palmistry, tea-leaf reading, cartomancy, tarot reading and crystal ball amongst others. 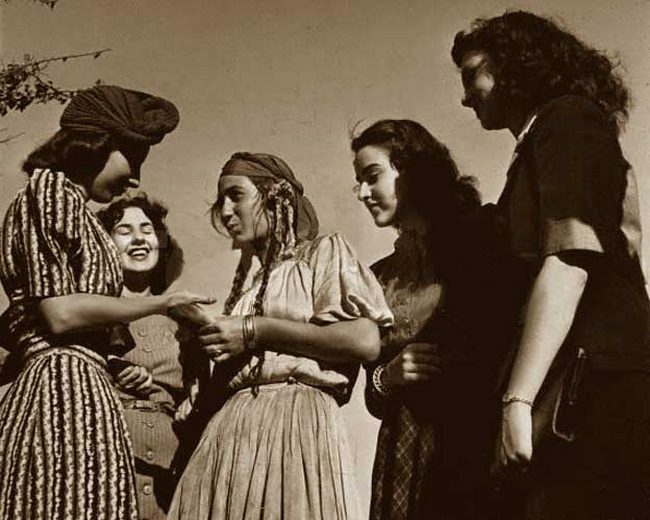 Roma women, as long as we have known anything of Roma history, have been arrant fortune-tellers. They plied fortune-telling about France and Germany as early as 1414, the year when the dusky bands were first observed in Europe, and they have never relinquished the practice. There are two words which are used by Roma for fortune telling – dukkering which is the modification of a Wallaco-Sclavonian word meaning something spiritual or ghostly. And bocht which is a Persian word meaning or connected to the Sanscrit bagya, which means fate. According to D. Kenrik, many Kalderash families specialize in fortune-telling, with the daughters learning from their mothers, but Sinti also have traditionally told fortunes. In Western Europe, fortune-telling is usually done by palm- reading while in Eastern Europe, coffee beans are often thrown to form a pattern. 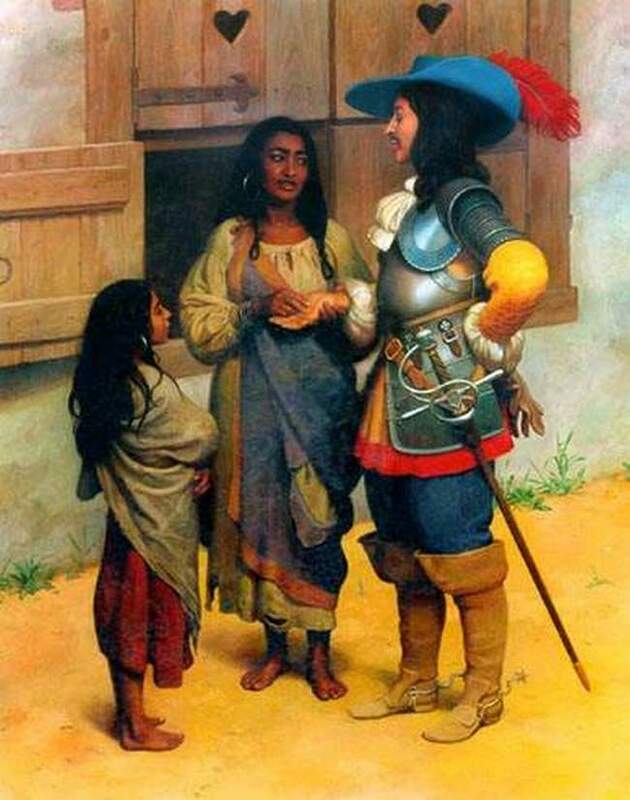 Fortune-telling was one of the occupations mentioned in the early reports of Roma — for example, in 1422 in Belgium and in the same year in Italy. The first record of palmistry in England is in 1530. The art probably originated in India. In England and Wales, fortune-telling was controlled until recently by the Vagrancy Act of 1824. Any person professing to tell fortunes could be arrested without a warrant. In fact, prosecutions normally take place under section 15 of the Theft Act, where, for example, a fortune-teller takes money away “to be blessed” and does not return it. 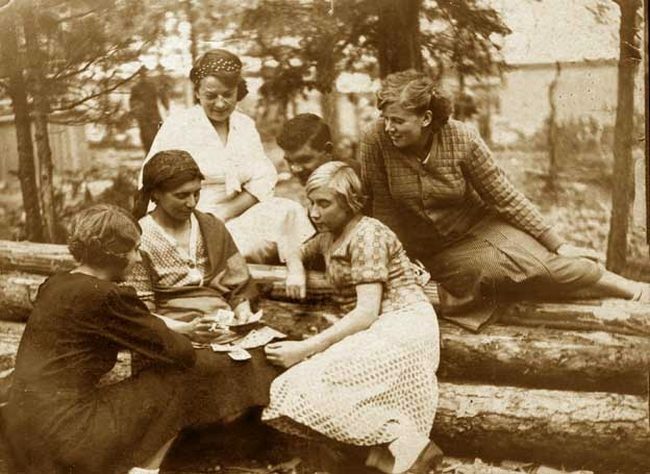 Roma females have told fortunes to higher people than the young Countess Jacinta: Modor – of the Roma quire of Moscow – told the fortune of Ekatarina, Empress of all the Russias. The writer does not know what the Roma told that exalted personage, but it appears that she gave perfect satisfaction to the Empress, who not only presented her with a diamond ring – a Russian diamond ring is not generally of much value – but also her hand to kiss. Whether playing cards were initially intended for fortune-telling or for games is still not known. What we do know though is by the 16th Century normal playing cards were being used for fortune telling and by the 18th Century were used in daily life. History even suggests Napoleon to have consulted the cards on a regular basis. Today tarot cards are used as widely for fortune telling and divination. In a tarot deck there are 78 cards – 56 minor arcana cards and 22 major arcana cards. Nicolas Regnier. “The scene of fortune telling.” 1625. Louvre, Paris. 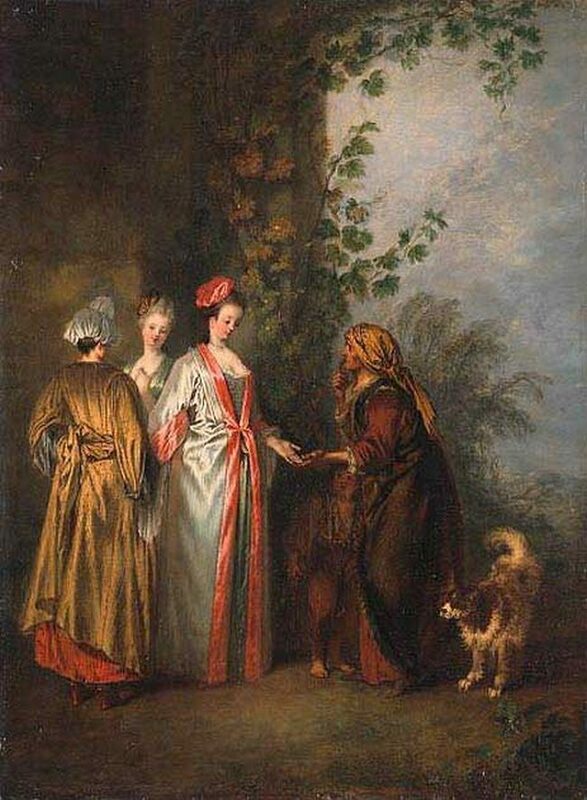 Antoine Watteau. “Fortune-teller”. 1710. Museum of Fine Arts in San Francisco. Nikolai Bessonov. “Fortune Teller” (in the Austrian city). 1993. As we see, the art of divination was respected profession that is associated with Roma. A lot of artists recorded it in their works, which we will present here. It’s attracted by its uncertainty and secrecy. Today, it spoiled by petty crooks and stereotypes of Roma as those who want only to deceive and rob people. You decide! But we hope that this publication will show the other side of the Roma culture.